In a large collaborative effort EJOLT (2011-2015) brought together science and society to catalogue ecological distribution conflicts and work towards confronting environmental injustice. 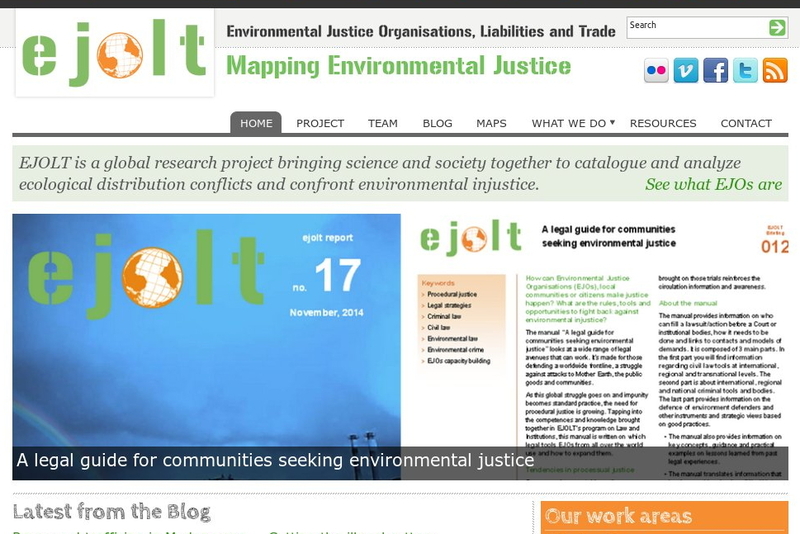 EJOLT brought together a consortium of 23 academic and civil society organizations across a range of fields to promote collaboration and mutual learning among stakeholders who research or use Sustainability Sciences, particularly on aspects of Ecological Distribution. One main goal was to empower environmental justice organizations (EJOs), and the communities they support that receive an unfair share of environmental burdens to defend or reclaim their rights. This was done through a process of two-way knowledge transfer, encouraging participatory action research and the transfer of methodologies with which EJOs, communities and citizen movements can monitor and describe the state of their environment, and document its degradation, learning from other experiences and from academic research how to argue in order to avoid the growth of environmental liabilities or ecological debts. The Environmental Justice Organisations, Liabilities and Trade was an FP7 project supported by the European Commission from 2011-2015. The project supported the work of Environmental Justice Organisations, uniting scientists, activist organisations, think-tanks, policy-makers from the fields of environmental law, environmental health, political ecology, ecological economics, to talk about issues related to Ecological Distribution. Central concepts were Ecological Debts (or Environmental Liabilities) and Ecologically Unequal Exchange. EJOLT focused on the use of these concepts in science and in environmental activism and policy-making. 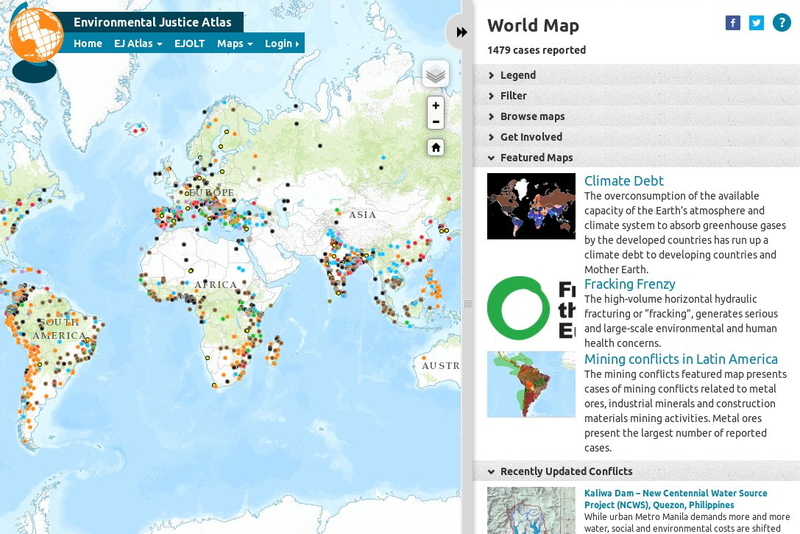 developed a database, ‘The Map of Environmental Justice’, that comprise an atlas of thematic and regional maps covering ecological distribution conflicts around the world, drawing on activist knowledge and linking them with material trade flows among other variables, and providing a platform for communication among EJOs and scientists working on related issues. to provide latest knowledge on indicators of social metabolism for the analysis of the environmental impacts of nuclear energy, oil and gas extraction, biomass extraction, mining and ship breaking and e-waste, focusing on the whole ‘commodity chains’ (from extraction to waste disposal or recovery). to unveiling some of the socio-environmental and public health impacts which are invisible to the consumers in the main resource importing and waste exporting countries, and to empower stakeholders to monitor and understand risks to environmental health. to apply methodologies that allow the study of the valuation languages deployed in ecological distribution conflicts, particularly related to environmental liabilities. to improve the basis for EJOs to undertake legal actions regarding environmental liabilities or campaign for institutional changes in corporate accountability. to develop the basis for EJOs to use notions and methods of calculation of ecologically unequal exchange and ecological debt. to hold workshops and develop an online resource library for EJOs on political ecology and public policies, environmental health (including popular epidemiology), ecologically unequal trade and the ecological debt, and legal redress. to translate project findings into concrete policy proposals to be communicated to decision makers in European, international institutions and corporate bodies. The emphasis of the recommendations will be on increasing corporate accountability and on legal institutional mechanisms to seek alternatives to and minimize harmful resource extraction and waste disposal. SERI coordinated the training and policy dissemination of the project. It thus contributed to knowledge on the various themes in the Project, both thematic and transversal-methodological.